Since my first excursion in Portugal in 2015 for Forrò de Lisboa and Andancas, I can’t help myself to go back every year to try a new festival. Portugal and especially Lisbon is beautiful, sunny and warm, and they know how to organise simple and joyful events full of friendly people. In 2016, after the amazing beach edition of Festival 3 Temps, I decided to try Raiz d’Aldeia, a small festival in june about which I’ve heard an unanimous praise. 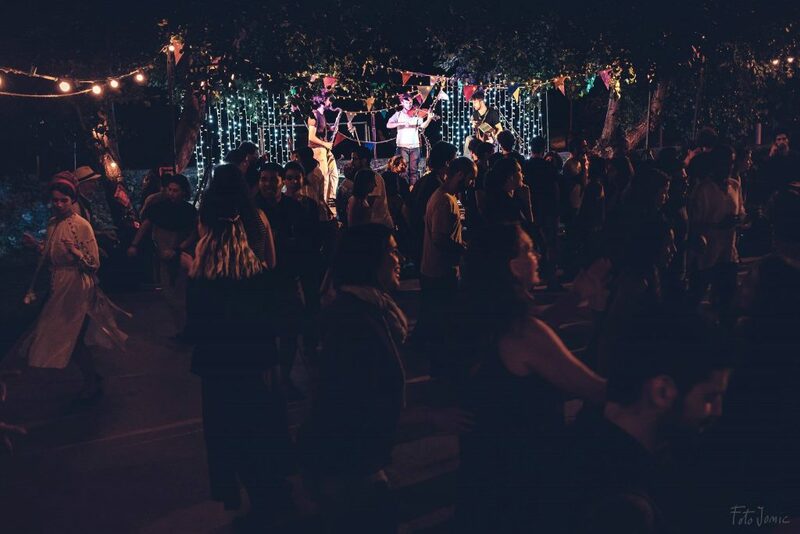 Like the festival Andancas, Raiz d’Aldeia is far from the big Portuguese cities, close to the spanish border. This year was a bit special since a huge fire sadly destroyed the Portuguese forest a couple of days before the festival, near Janeiro de Cima, killing 60 people. If you need proof that people can show solidarity in the worst moments, a collect of food and clothes was organised during the festival to help the survivors. Organisers showed great solidarity for the unfortunate and care for the safety of the dancers. As we traveled across the devastated lands, still smoking, we can’t help ourself but to think about how careful we need to be to protect our environment. Every time I came in Por (that’s it with the moralizing paragraph). Back to Raiz d’Aldeia ! 2017’s line up was most agreeable, which seems to be a permanent feature of Raiz, but with a singularity I’ve never encountered before : some bands playing twice in the week end. It is unusual for sure, and you may think it will be boring, but not at all ! Every evening is so good, you’re just very happy to make it happen a second time ! The first band to play was a cute and charming duet from Portugal, Ledok, with a bit of singing and numerous influences like jazz. I really liked it even though some tunes are maybe a bit tricky for a festival opening when you’re not quite warmed up. Bruno Letron (solo accordion), was amazing as always, simple and nice musician with beautiful melodies. Duo Botasso (violin & accordion), the two brothers are as funny as talented, with some energetic music. They played some Italian dances, and I deeply believe that Italian and Portuguese music and dancers are made for each other. And finally, the funny Duo Vandenabeele Knapen (violin & guitar). I believe they enjoyed the festival very much, with all its people, activities, food and drinks, and then spread their happiness to the dancers, which proves again that mixing very happy musicians with dancers makes the best atmosphere for an event. They proved it by sharing a lot of time with the dancers, in jam sessions or swimming in the lake. Needless to say that not all the organisations incite professional artists to stay the whole week end and mix up with their public, that’s another of the particularities of the bal folk universe, and I hope it will stay that way. Second complaint, is about the tendency of Portuguese people and all the countries where the weather is warm, to make events start late. As people know it will start late, they’ll show up even later. Good point is : we never missed the first tunes. But I can’t help myself to think that at the French clock we would start at 8pm and have 3 bands playing instead of 2. But clearly people from Raiz know how to deal with the wait. And obviously it’s with food and hydromel, because Raiz provides to all our needs. Huge thank you Mr Hydromel, you know your stuff! The village, Janeiro de Cima, is not really easy to access and you’ll need a car to go there, but once on the spot you’ll be chill-ready for 3 days. That festival is like a summer camping with bal folk included : there is a field for the tents (or a small forest a few meters from there if you need shade), a small lake/river (rio Zêzere) with its beach bar (providing breakfast, lunch, beers, ice creams and showers…), an outdoor kitchen, a grass beach with picnic tables, hammocks just waiting for you to take a nap and small stalls to buy snacks. You can as well hang out in the village or go for a walk in nature. The village in itself is absolutely cute, with its schist houses. 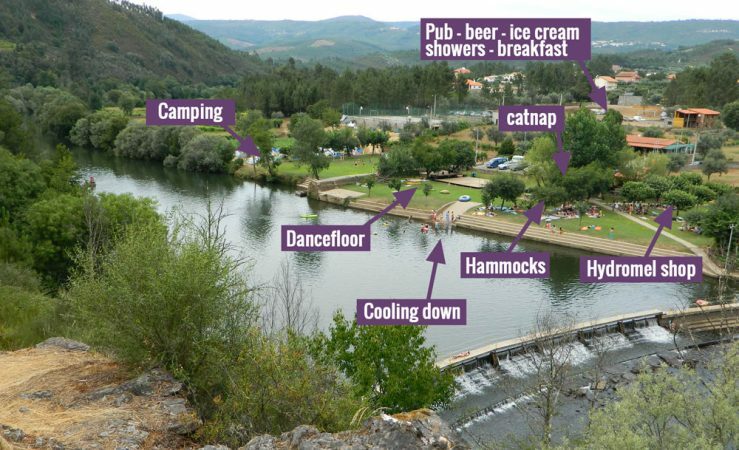 Days at the festival are holidays, if the weather gets too warm, we just have to roll from our towel to the lake then back from the lake to the pub’s ice creams. The only advices I could give for those planning to visit Raiz in the future are, like all the festivals in the countryside, you should expect a huge difference of temperature between day and night, so bring a warm sleeping bag. I wouldn’t bring food to the festival, because they have nice snacks in the festival, a excellent (and cheap !) restaurant in the village proposing traditional dishes, and event a cute small superette in the village that can provide all the necessary products to make a splendid salad. Every afternoon a workshop is organised in the village’s activity room. On Friday, Olha Kishulko from Spain gave a workshop Linguagem Musical para Bailarinos, which was very interesting for the part in understood (unfortunately not in english). We spent 2 hours listening to music in a nice quizz to find the good tempo, looking for strong beats and off-beats. An exercise requiring a lot of attention we sometimes do in lessons, but not often, and never that long. A very good exercise for the mind. The second workshop I had the pleasure to organise and dedicated to couple dancing and close embrace, as we studied how to enter and leave the close embrace in good conditions (willingly, with joy, respect and care for the partner) and some variations we can use in close embrace where the space is crowded. It was a great experience for me, and a lot of fun, as I had several experiences in teaching before, but it still feels very impressive to speak to a crowd. 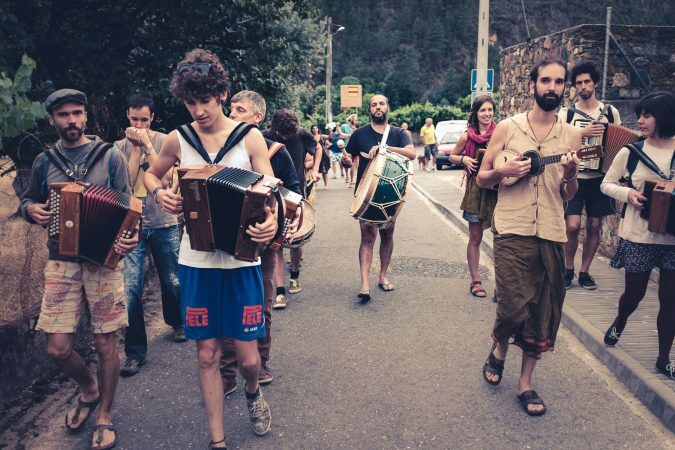 In the same time, Bruno Le Tron took musicians and dancers for a musical walk in the village to interact with the nice local people, and Simone Botasso improvised an accordion workshop at the cafe. Raiz d’Aldeia 2017 was absolutely lovely with its nice people, cute trees, great bands, delicious food. It has some similarities with my favourite festival so far, Chatillon en Diois. It has some qualities I value highly for a dance festival like human size, one single dance floor so you won’t miss anything, plenty of time for naps, long brunch, beer, with a pinch of workshops, and a good part of craziness. These are the best festivals in my opinion, and great to meet people if you are traveling alone. Now, if you plan to go to Portugal, there are some festivals I would recommend you to go, or that I plan to try myself one day or another.